An outline of CRISPR/Cas9 mouse model generation services available through the VGER. Additional protocols and service forms are provided below. Contact Leesa.sampson@vanderbilt.edu for more information. CRISPR-Cas9 technology has emerged as a rapid, highly-precise method to generate knock-out and knock-in mouse models. 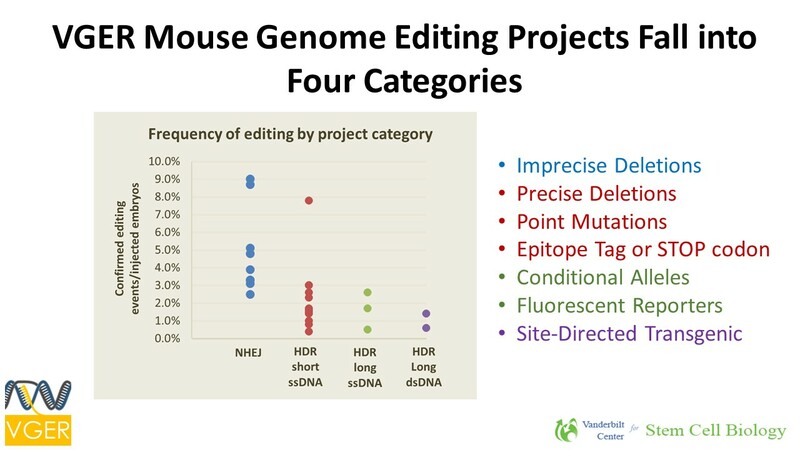 We can perform your genome editing project for you from strategy design through founder genotyping. We successfully created 34 new mouse models at a 100% technical success rate in 2018. These included seven gene deletions, fourteen point mutations, six epitope tags or STOP codon insertions, four conditional alleles (floxed), one fluorescent reporter knock-in, and two site-directed transgenes inserted into the Rosa26 locus. Contact leesa.sampson@vanderbilt.edu to schedule an advisory meeting. Following the meeting, the investigator completes the "VGER Gene Editing Service Form" (see attachment below) and is provided with an estimate. A genome editing strategy is devised and reviewed with the investigator. We now have four classes of CRISPR/Cas9 editing strategies based on the donor DNA format and length of the desired gene edit. See the attachment below for efficiency data fon each type of project. ctRNAs are ordered and tested in vitro in a ribonucleoprotein format with tracrRNA and Cas9 protein for on-target efficiency at the desired genetic locus. See the "MilliporeSigma 2018 Pricing" attachment below for current reagent pricing. A donor ssDNA is designed for homology directed repair projects and reviewed with the investigator. Typically, Cas9 protein, ctRNA(s), and a ssDNA oligo or dsDNA are injected into mouse zygotes at the one cell stage. F0 pups are biopsied for genotyping and screened by a VGER-developed PCR based assay. F0 Founder(s) are analyzed by Sanger Sequencing to identify those containing the predicted desired gene edit. F0 Founder(s) is transferred to investigator for breeding to WT and validation of the desired genome edit in the N1 generation. Breeding and screening of the N1 generation is also available by estimate upon request.